Oh what a day it was for cricket yesterday. It was a beautiful sunny day at The Wanderers in Johannesburg with Australia set to take on South Africa in the deciding match for the 1 day series. Australia won the toss and elected to bat. What a good decision - Australia started off slow, but then steamed to a world record 434 runs (for 4 wickets) in their allotted 50 overs. Amazing!!! This was the first time a team had cracked 400 runs in an ODI. Thanks Graham Smith. Its been hard for the Aussies to motivate themselves for yet another round of meaningless one day games but you've given Ricky the all the ammo he needs to fire himself and the rest of the boys up. Could there possibly be a hole deep enough for Smith by the end of that innings- We'll see now who chokes under the pressure of having to get 435 to win. I predict the record for the greatest winning margin will also go tonight. 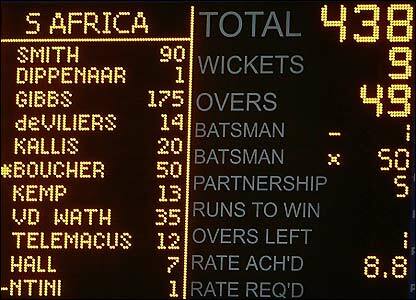 I think Graeme Smith must have read this before he went into bat as he certainly got the South Africans to give the Aussies some stick of their own... 438 runs later, South Africa had broken the Australian's new world record and won the game too. Unbelievable!!! 873 runs in 100 overs which included 113 boundries. This has got to have been one of the most exciting games of cricket ever. I just wish I had Sky and the time to have sat down and watched the whole game, or even better, I wish I was there.